Our summary of recent jury and EEOC verdicts and settlements for October 2018. Maryland: M&R Consulting, LLC to pay $40,000 to settle disability discrimination lawsuit. The home care agency (doing business as Home Instead Senior Care) allegedly wrongfully rescinded an applicant’s offer of employment based on a skin test because it regarded her as having tuberculosis, even though the applicant submitted and the company confirmed in another test that the applicant did not in fact have tuberculosis. The employer hired the qualified applicant for a caregiving position, subject to passing pre-employment requirements as well as the skin test. Due to the result of the test being positive, the company perceived the applicant as being disabled and withdrew the offer to the applicant, thus allegedly violating the Americans with Disabilities Act (“ADA”). Hawaii: G4S Secure Solutions, Inc. settled disability discrimination charge for $90,000. The security company located in Hawaii allegedly denied reasonable accommodation to an employee undergoing medical treatment. The security guard required additional leave while undergoing treatment. In lieu of the additional leave, the security guard was terminated. Washington: Jackson Foods settled disability discrimination lawsuit for $88,000. The Idaho-based convenience store chain refused to interview a deaf applicant in Washington State. Once the applicant informed the company that he is deaf and would need an interpreter, they refused to proceed with the interview. As a result of settlement negotiations, the company will provide the applicant a job in one of its Washington State locations in additional to the monetary settlement. Colorado: Teamsters Local Union has agreed to pay $153,000 to resolve a discrimination class finding under Title VII. After complaints by workers, the EEOC investigated the Union and found reasonable cause that the Union denied its members fair union representation for failing to advocate for them, and subjected them to retaliation and a hostile work environment because of their race, national origin and religious beliefs. D.C.: B.F. Saul Companies to pay $210,000 to settle disability discrimination suit. B.F. Saul, hotel owner and operator, terminated female employee with breast cancer a week before her surgery. B.F. Saul Companies own and operate business-class hotels under franchise agreements with hospitality organizations such as Marriott International, Hilton, etc. The employee was an area sales managers for two Marriott hotels in the Dulles region owned by B.F. Saul. The employee’s supervisors and the Company learned that the employee had been diagnosed with breast cancer after the employee informed her employer she was scheduled to undergo surgery and would likely need reasonable accommodation after her surgery. One week prior to surgery, the Company terminated the employee. The suit included individual allegations against the vice president of the human resources who allegedly told the employee it would take too long for the employee to recover from the surgery. New York: Jewish Board of Family and Children Services agency has agreed to pay former employee $60,000 to settle retaliation complaint. Social services agency terminated employee because she complained about disclosure of confidential medical information regarding her disability. The employee attempted to have the confidential information removed from a duty log that other employees at the facility could access. 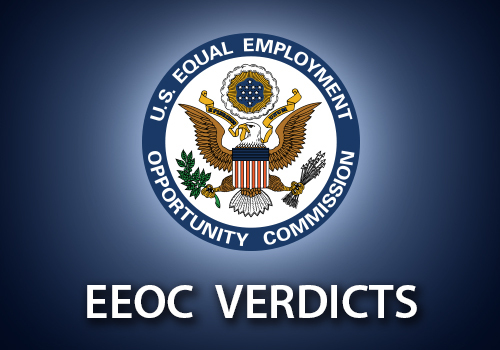 After the agency failed to remove the information, the employee filed a charge with the EEOC. After filing the charge alleging violations of the ADA, the agency terminated the employee’s employment. Maryland: Cloverland Farms Dairy will pay $75,000 to settle disability discrimination suit in Baltimore. The major milk producer allegedly revoked disabled employees’ use of parking spots reserved for individuals with disabilities, allegedly forcing the employees to park farther away from the facility entrance. Three long-time employees with disabilities were allegedly told they were no longer allowed to park in parking spaces designated for individuals with disabilities, while the company allegedly allowed others without disabilities to use the parking spaces. Colorado: Bendinelli Law Firm to pay $30,000 to settle pregnancy discrimination lawsuit. The law firm allegedly terminated the employment of legal assistant the day after she disclosed her pregnancy and after just 10 days of employment. The law firm explained to the EEOC that the employee was terminated because she failed to disclose her pregnancy during her interview. The EEOC challenged this explanation as unlawful and discriminatory. Arizona: Mariscos Altata restaurant company to pay $220,000 to settle sexual and age-based harassment and retaliation charges. The Phoenix restaurant’s female employees were allegedly subjected to sexual harassment and unlawful conduct beginning in 2011. The restaurant also allegedly retaliated against the women who refused to comply with sexual demands. In addition to the monetary settlement terms of the consent decree, the restaurant was ordered to revise its employment policies in consultation with an outside consultant, to terminate the alleged harasser, and to train its managers and employees on anti-harassment law.